The 52 Open is one more example of Viking’s ability to build a model within a model where we utilize a proven hull, in this instance the hull of our popular 52 Convertible, and put our legendary and tireless $1 million five-axis profiler to work creating a new deck assembly. 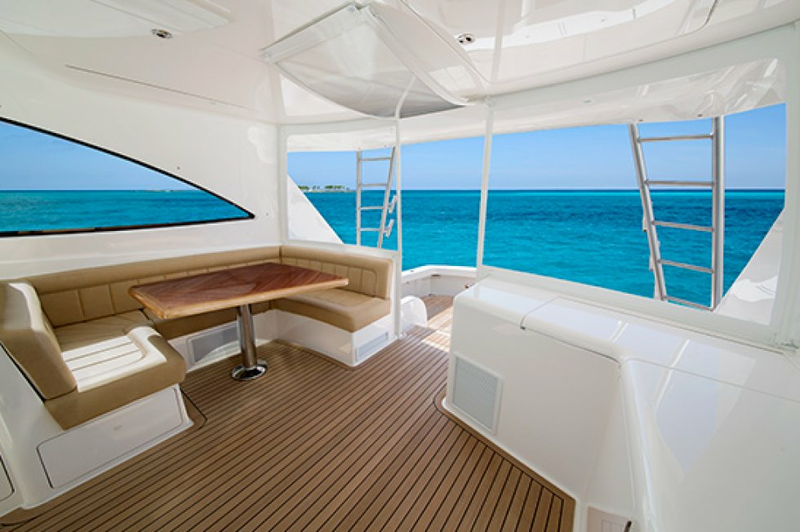 With the 52 Open this meant a wraparound windshield for ample weather protection and excellent visibility from the helm. 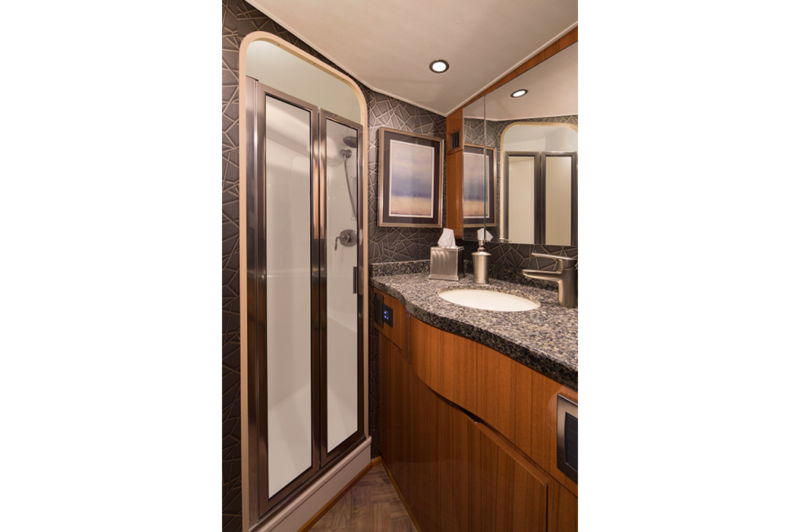 Accented molded feature lines wrapping around the raised deck assembly provides a subtle yet distinctive signature of definition contributing to the yacht’s sleek appearance. 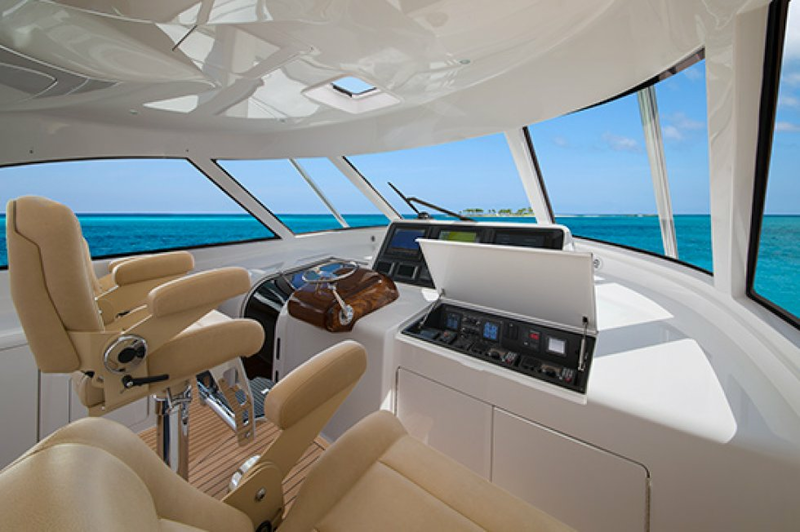 Our subsidiaries, Palm Beach Towers and Atlantic Marine Electronics can outfit the 52 Open with custom electronics, equipment and accessories making the boat, like every Viking yacht, turnkey ready, accommodating its owner with total satisfaction. You are cordially invited to contact your Viking dealer now to make arrangements to get aboard and experience this model. 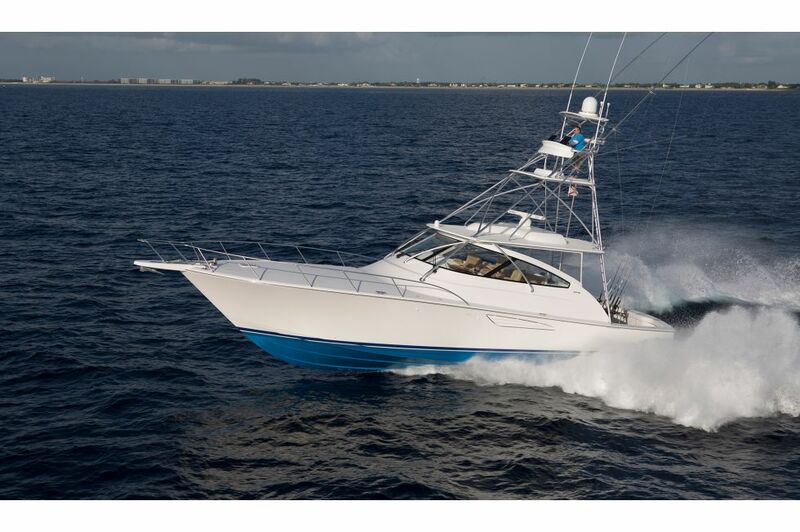 The hull of the Viking 52 Convertible is a perfect platform for this new 52 Open. With its aggressive entry, 12-degree transom deadrise, and molded strakes for lift and planing efficacy, the resin infused hull features a matrix of DuPont Kevlar, knitted fiberglass laminates, end-grain balsa and foam coring, custom blended modified epoxy and polyester resins, and vacuum-bagged bulkheads. The command deck has an informal and inviting out-of-doors feel with its open back providing instant egress to the cockpit. 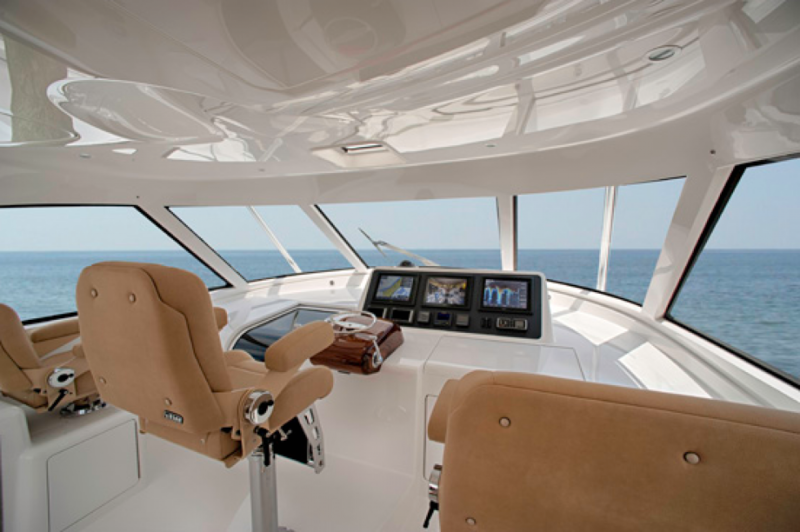 Forward, the helm is on centerline with a pedestal seat on a raised platform. Additional seating is to port and starboard. A raised pod plays home to navigation and communication electronics for easy viewing and use. 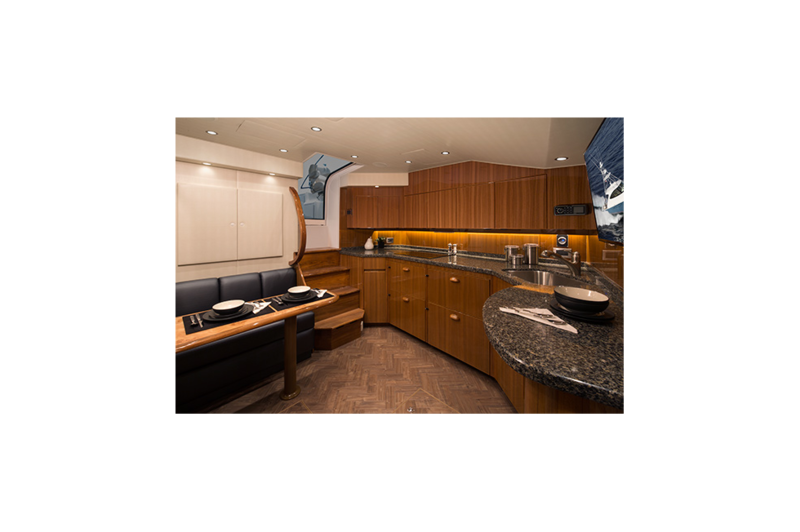 Abaft the all business area of the helm, there is a convergence of practical and convenience features, including refrigeration, plus tackle and gear stowage compartments. Plump cushions topping the U-shape lounge surrounding the hi-lo table provide firm support while allowing guests generous seating and ample height to take in their surroundings. Below, the 17 ft. 6 in. 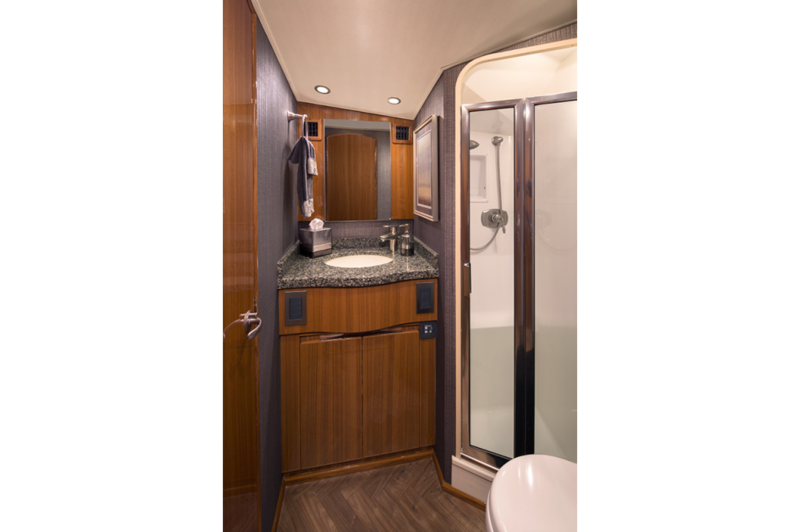 beam offers large volumes of interior space including a choice of two and three-stateroom layouts. 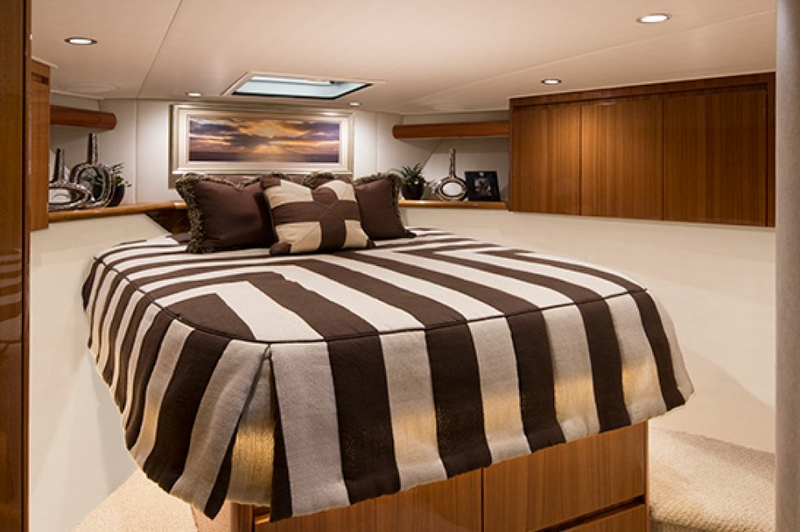 In either plan, the forward master stateroom is large and fitted with a queen-size bed, plenty of hull-side stowage behind the teak cabinetry, available in satin or high-gloss finishes, and served with a private head. 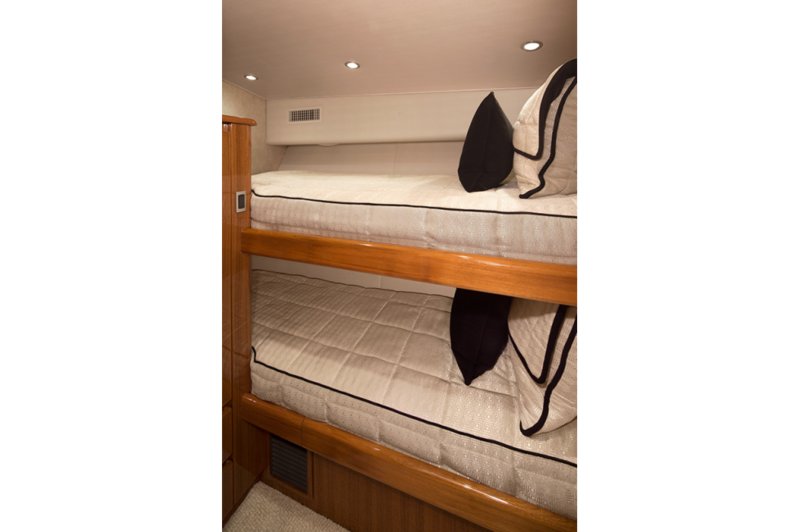 Additional staterooms are found on the starboard side, each with upper and lower berths. 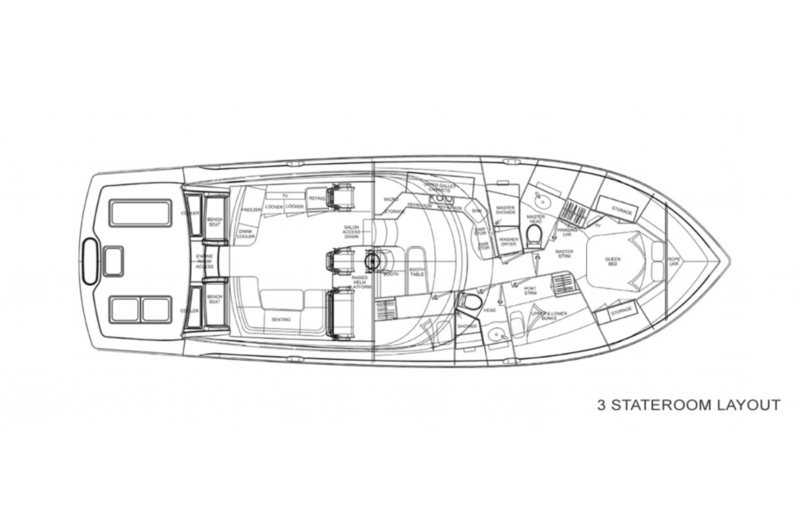 The head has private access in the two-stateroom layout, but guests share it in the three-stateroom plan. 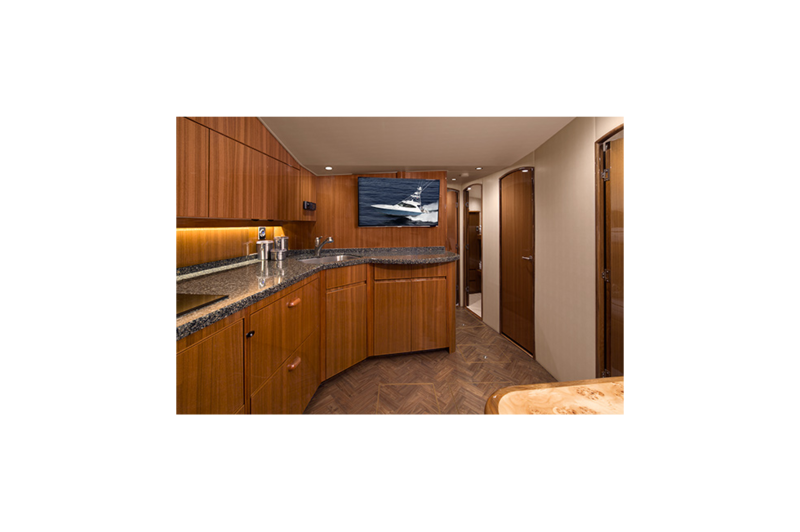 Midship on the port side is a well appointed galley with a full appliance package, under mounted Corian sink and under counter refrigeration. Opposite the galley in the two-stateroom model is an L-shape lounge and table. The three-stateroom version utilizes booth seating. 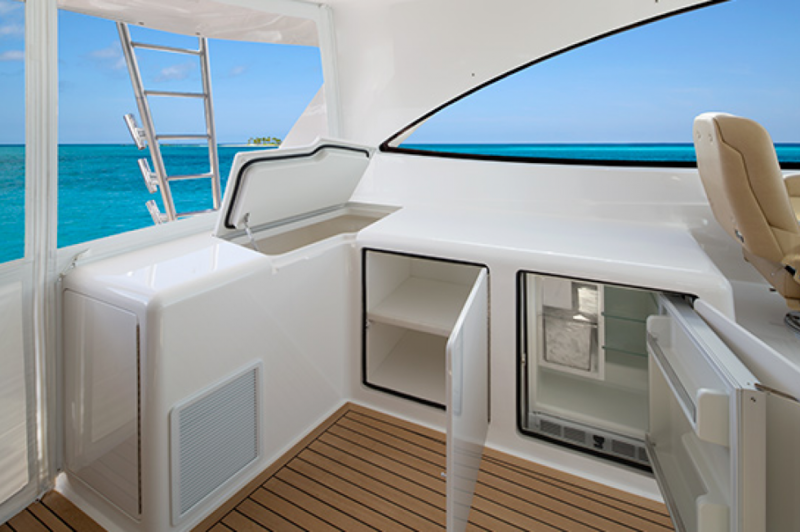 The 142 square-foot cockpit has twin mezzanine seating with stowage room below, easily converted into optional freezer space, along with drink and bait coolers, recessed in-deck fish and stowage boxes, a transom live well, and a transom door with a lift gate. The engineroom, easily reached through a set of lift steps built into the mezzanine house the twin MAN V12 1400 CRM second generation common rail engines. Cruise speed is in the mid-30 knot range with a top end around 40 knots depending upon load, sea and environmental conditions. With its DC power-assisted hydraulic steering, matched to stainless-steel, high-speed rudders, and single-lever electronic controls, the 52 Open delivers outstanding performance, comfort and range. 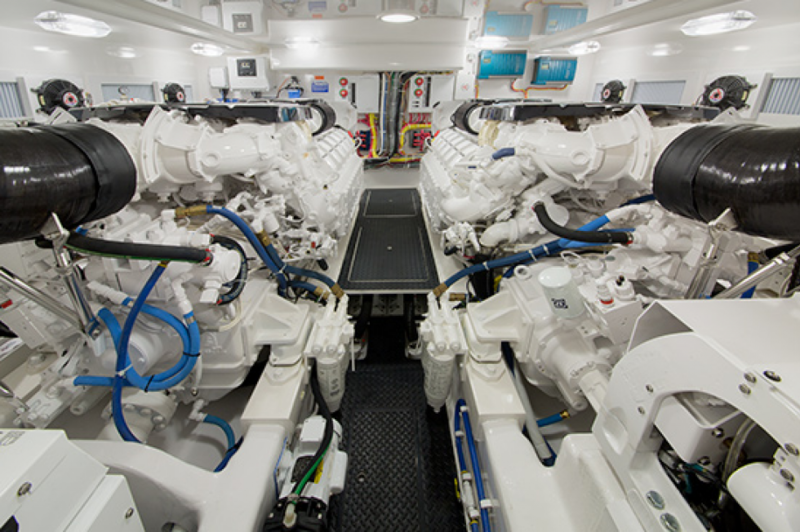 As you would expect, the engineroom is equipped in the Viking tradition with outstanding engineering attention to detail including a Delta T ventilation system with supply and discharge fans for proper fresh air supply and water suppression, oil changing system for the engines, transmission and generator, a Glendinning Cablemaster, engineroom gauges, and a voltage stabilizer transformer.